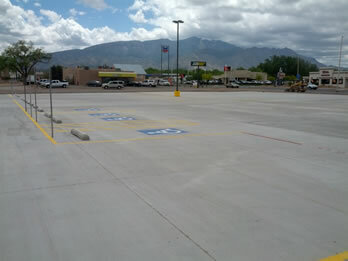 Concrete parking lots offer superior performance compared to pavement alternatives. Incorporating straightforward design and ease of construction, concrete pavement is also the economical choice for the long-term. 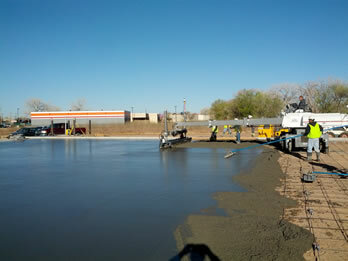 Because of its strength, durability, and minimal maintenance requirements, concrete parking is like money in the bank. Enhanced Safety: Concrete's reflective surface means brighter and safer surroundings for pedestrians and drivers. Reduced Lighting Costs: With three times the reflectivity of asphalt, concrete parking requires less lighting, reducing costs by up to 30%. Strength and Durability: No other paving material approaches concrete’s strength and durability in standing up to heavy usage and truck traffic. Competitive Initial Cost: Without expensive bases and reinforcement, and with integral curbs and gutters, projects can be completed in one pass, more quickly than the alternatives. Most Economical Over Long Term: Concrete pavement lasts longer, without the need for resurfacing, patching or surface sealing. Normal maintenance costs of asphalt pavements—sealing, re-striping, resurfacing, and loss of business during maintenance operations—greatly exceed those needed for concrete. Environmentally Friendly: Concrete is produced from abundant natural resources, reduces toxic run-off and can be easily recycled. It is also cooler in the summer which provides outdoor comfort while reducing the “heat island” effect. Versatility: Concrete can be fashioned with an array of decorative textures, shapes, patterns and colors. Upscale Appearance: Concrete’s clean look creates a good first impression and lasting sense of quality for customers, tenants and employees.